AMD has just debuted its Radeon Fury and 300 series GPUs at E3. And demoed a new dual Fiji card which stands to be the fastest in the world. The dual GPU graphics card which we have yet to confirm the name of features two Fiji GPUs. Fiji is AMD’s newest, largest, most advanced and most powerful chip to date. It’s also the first GPU in the world to feature stacked High Bandwidth memory. First let’s quickly talk about AMD’s new Fury cards which there are three of. First is the R9 Fury X, the fastest single GPU Radeon in existence. The card features a liquid cooled design and will debut on June 24th at $650. Second in line is the R9 Fury, which features a cut down version of the same Fiji GPU powering the Fury X. The card features an air cooled design and will debut on July 12th at $550. Finally we have Fury Nano, the world’s most powerful mini-iTX GPU. The card is also based on a cut down version of the Fiji GPU powering the R9 Fury X and R9 Fury. The card is six inches long and features an air cooling design. Amazingly, the dual Fiji graphics card is actually no longer than a single Fury X graphics card. 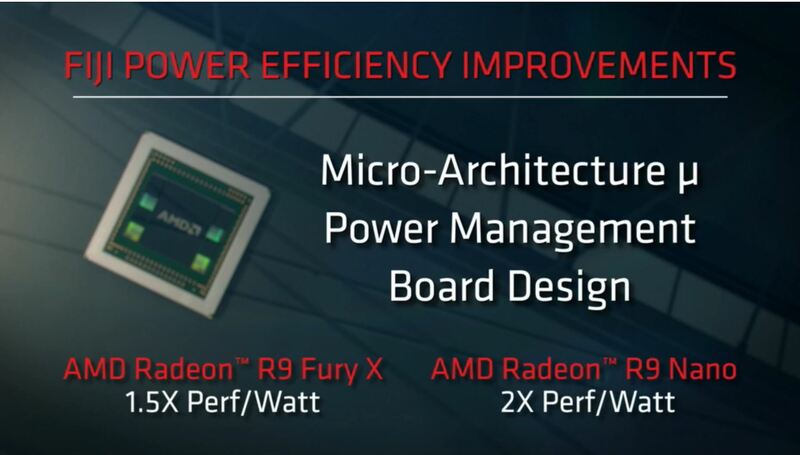 AMD described this board as “two Fury X cards” in one. 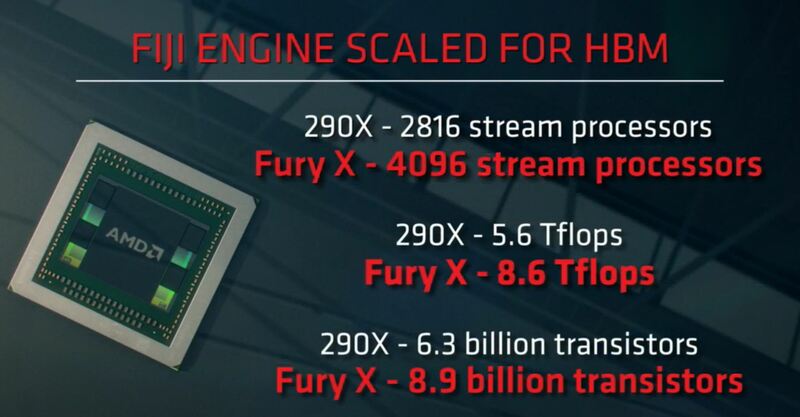 Each Fury X graphics card has a computing power of 8.6 TERAFLOPS. Making a dual GPU board a 17+ TERAFLOP number crunching supercomputer. Project Quantum pictured above is a small form factor PC powered by this dual Fiji board. Project Quantum is a console sized box, but the similarities end there. Because this mini supercomputer over 9 times more powerful than a PS4 and a whopping 13 times more powerful than an XBOX ONE. And all of this oomph is enabled by the dual FIji board pictured below. If you haven’t already read our article about Project Quantum you should check it out here. Now let’s briefly talk about Fiji and it’s new secret weapon, HBM, which enables these new small form factors and massive power efficiency gains. HBM represents the revolutionary step that has been so badly needed in the evolution of graphics memory standards. The first generation of HBM promises to deliver 4.5X the bandwidth of GDDR5 and a staggering 16 times the bandwidth of DDR3. Both GDDR5 and DDR3 are eclipsed by the 128 GB/s figure for first generation HBM. The second generation promises to double the bandwidth by doubling the speed from 1Gbps to 2Gbps. While also quadrupling the memory capacity for 4-Hi stacks from 1GB to 4GB. HBM2 will be featured in AMD’s upcoming Arctic Islands graphics architecture with the “Greenland” flagship GPU. In our technical deep dive on Fiji we were able to draw a rough estimate of the Fiji’s performance based on the core count and the clock speed. But as we can’t yet quantify the performance benefit from HBM without rigorous testing we left it out of the equation. Even without putting HBM into the equation the estimated performance of Fiji XT is quite phenomenal. Here are the specifications for AMD’s upcoming “ultra-enthusiast” Fury line of graphics cards. The AMD Radeon Fury X and Radeon Fury powered by AMD’s largest, most powerful and most advanced GPU to date code named Fiji. The post AMD Reveals Dual Fury Board, World’s Fastest Graphics Card – 17 TERAFLOPS Small Form Factor Behemoth by Khalid Moammer appeared first on WCCFtech.